← Click for an intro! The April MMMM is now closed and the results are in. A total of 364 people solved the meta. You can see the full write-up and solution here. The 2019 mega-meta is a famous rock song. Guessing the mega-meta early earns you lots of bonus points. If you want to submit a guess for the mega-meta, use the appropriate form on the right sidebar. We redesigned the page a little. The meta submission box is now on the right sidebar instead of the page bottom. Puzzle clues marked with (***) indicate a connection to the mega-meta (this was the case in 2016 and 2017 but not last year). Click on the mega-meta sidebar link to submit a mega-meta answer. Musical taste and experience vary. 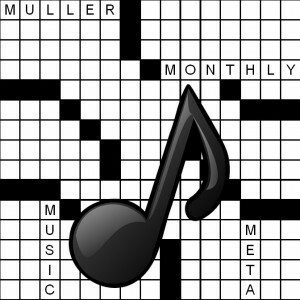 You may not have heard of some of the meta songs or bands, but they will always be gettable via an online search once you figure out what’s going on in the puzzle. The first few metas will start off pretty easy. Difficulty will grow throughout the year, with a slight pullback in December. The 2019 contest once again features a mega-meta, hidden in the 12 monthly puzzles. Puzzle clues marked with (***) indicate a connection to the mega-meta. It’s up to you to figure out what’s going on. You can enter your solution to the mega-meta in the box at the right at any time during the year, and the scoring is the same as last year: The earlier you solve the mega-meta, the more bonus points you get. Full details can be found in the Contest Rules. Because the reward is so large for getting the mega-meta before the final puzzle, there may be some tricks designed to throw solvers off the track. Consider yourself warned. Click here (SPOILER ALERT) for the write-up on last year’s mega-meta (and here for the 2017 mega-meta). You need to get 9 out of 13 metas to qualify for the Grand Prize drawing.